Solar powered laptop chargers offer a great alternative way of extending the battery life of any laptop by using renewable, clean energy which doesn’t cost anything. Solar laptop chargers come in different capacities and designs. They may represent by itself the whole system or a smaller solar cell panel. 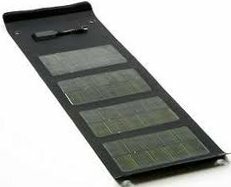 Though, the main cornerstone for any system to work is the solar cell, which is capable of receiving, absorbing and converting the energy from the sun-light into electricity, which will power the laptop. It is also possible that solar powered laptop charger will consist of several units. It will have a special solar cell panel or so that will get the sun-light and convert it into energy, as well as it may be equipped with special storing unit, which in turn will be the one, that will power the laptop battery. The disputes about which one is better always come to the fact, whether you value portability and size more than the laptop work time. Because the system with storing battery will offer more power time for the laptop, but will also be bigger in physical size considerations than the solar system which will charge laptop directly. UK distributor of solar products, Nigel’s Store, has a great solar powered laptop charger solution available. Solar Gorilla Laptop Charger is a compact solar panel system kit that is powerful enough to charge even a laptop. The Solar Gorilla is equipped with clever electronics, and its solar panels produce an incredible 10 Watts if in direct sunlight, which is more than enough to run any portable electronic device including a laptop, or notebook, as well as mobile phone, iPod, and more. It is incredibly tough and also water resistant, which makes the Solar Gorilla ideal for travelling or working in the outdoors, in a field, cafe, beach or mountain. Another great distributor of eco solutions in the US, Espow, can offer a creatively designed solar laptop charger Electric Eye Multicrystal Silicon 16000mAh Solar Laptop Battery Panel Charger. It needs less than 3 hours of wall charging to be fully charged and then its internal battery can provide 3 - 5 hours of run time for your laptop without additional filling in.